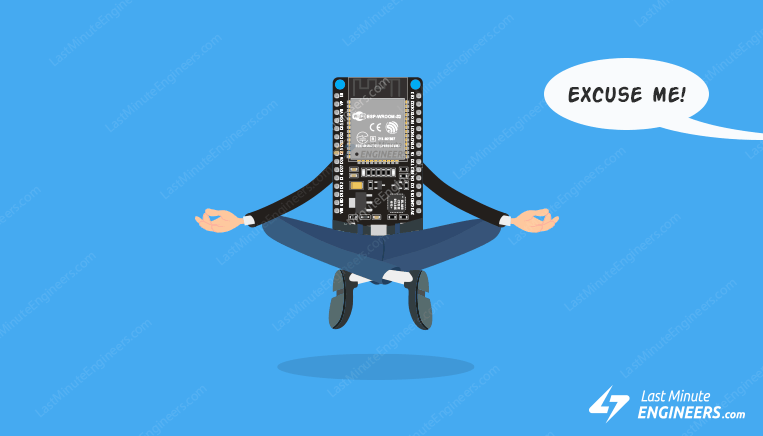 Often in a project you need the ESP32 to execute its normal program while continuously monitoring for some kind of event. A solution widely adopted is the use of an Interrupt. The ESP32 offers up to 32 interrupt slots for each core. Each interrupt has a certain priority level and can be categorized into two types. In ESP32, we can define an interrupt service routine function that will be called when a GPIO pin changes its signal value. With an ESP32 board, all the GPIO pins can be configured to function as interrupt request inputs. In Arduino IDE, we use a function called attachInterrupt() to set an interrupt on a pin by pin basis. The recommended syntax looks like below. 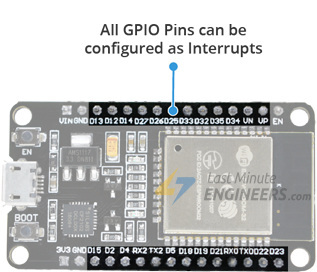 GPIOPin – Sets the GPIO pin as an interrupt pin, which tells the ESP32 which pin to monitor. ISR – Is the name of the function that will be called every time the interrupt is triggered. You can optionally call detachInterrupt() function when you no longer want ESP32 to monitor a pin. The recommended syntax looks like below. Interrupt Service Routine is invoked when an interrupt occurs on any GPIO pin. Its syntax looks like below. ISRs in ESP32 are special kinds of functions that have some unique rules most other functions do not have. The interrupt service routine must have an execution time as short as possible, because it blocks the normal program execution. By flagging a piece of code with the IRAM_ATTR attribute we are declaring that the compiled code will be placed in the Internal RAM (IRAM) of the ESP32. Otherwise the code is placed in the Flash. And flash on the ESP32 is much slower than internal RAM. If the code we want to run is an interrupt service routine (ISR), we generally want to execute it as quickly as possible. If we had to ‘wait’ for an ISR to load from flash, things would go horribly wrong. Enough of theory! let’s see practical example. Let’s hook one push button to GPIO pin 18 (D18) on the ESP32. You don’t require any pullup to this pin as we will pull the pin up internally. The following sketch demonstrates the use of the interrupts and the correct way to write an interrupt service routine. Once you upload the sketch, press EN button on the ESP32 and open serial monitor at baud rate 115200. 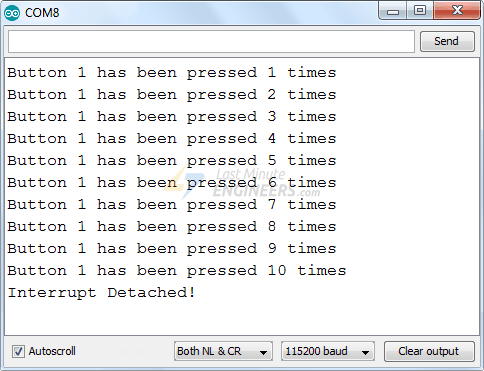 Now we will get the output as shown below, when you press the button. At the very start of the sketch we create a structure named Button. It has three members viz. pin number, number of key presses and pressed state. If you don’t know, Structure is the collection of variables of different types (but logically related to each other) under a single name. Next we create an instance of the Button structure and initialize pin number to 18, number of key presses to 0 and default pressed state to false. The following piece of code is an Interrupt Service Routine. As mentioned earlier, ISR in ESP32 should have the IRAM_ATTR attribute. In ISR we simply increment the KeyPresses counter by 1 & set button pressed state to True. In Setup section of code, we first initialize the serial communication with PC. Then set input pullup the D18 pin. Next we tell the ESP32 to monitor the D18 pin and call the interrupt service routine isr when the pin goes from HIGH to LOW i.e. FALLING state. In Loop section of the code, we simply check if the button pressed state returns to be true. When it does, we simply print the number of key pressed till now and set the button pressed state LOW so that we can continue getting next interrupts. In loop section we also check the number of milliseconds that have passed since the program first started using millis() function. When this time is more than 60,000 milliseconds or 1 Minute, we simply tell ESP32 to not to monitor D18 pin using detachInterrupt() function.